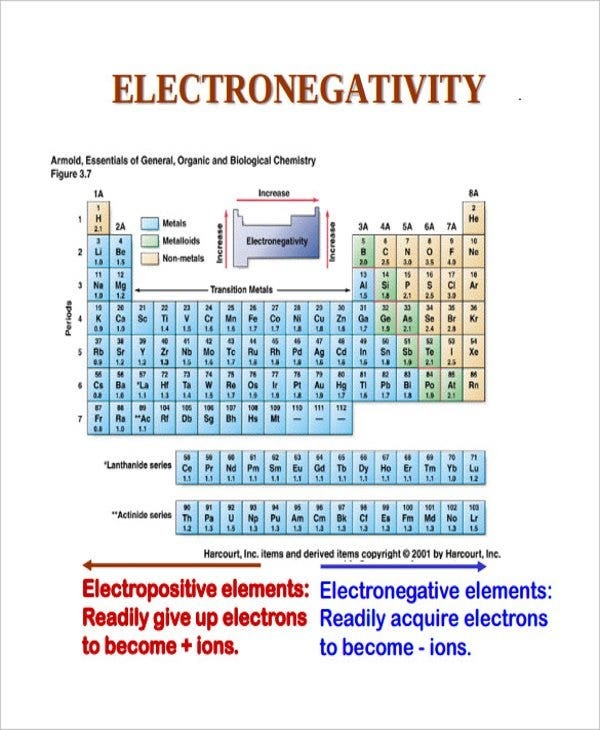 Electronegativity is all about how you measure the tendency of an atom to attract electrons. Sometimes it could be a functional group that attracts a bonding pair of electrons. 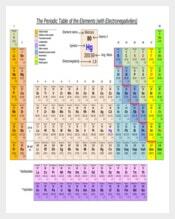 With an Electronegativity Chart Templates, it is easy to have a chart with Table of Contents (ToC) with electronegativity values of the various elements one below the other on the periodic table. 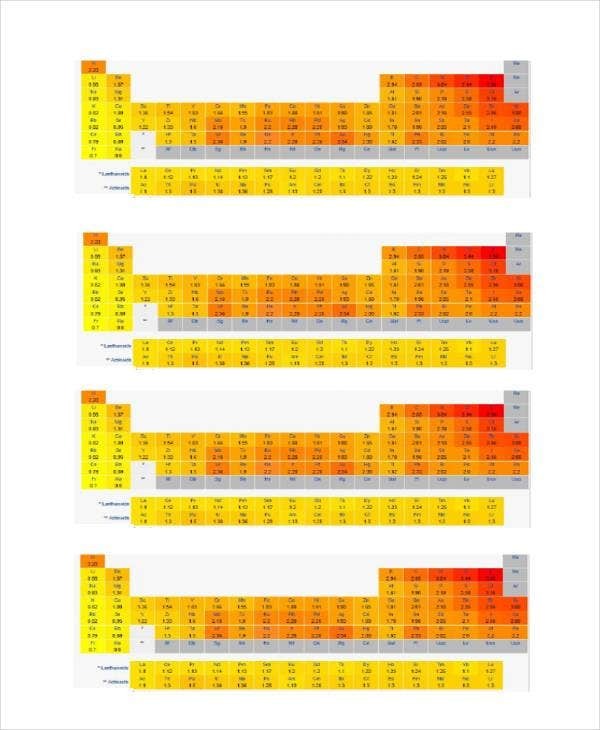 Element Electronegativity Charts measure multiple items of the periodic table. 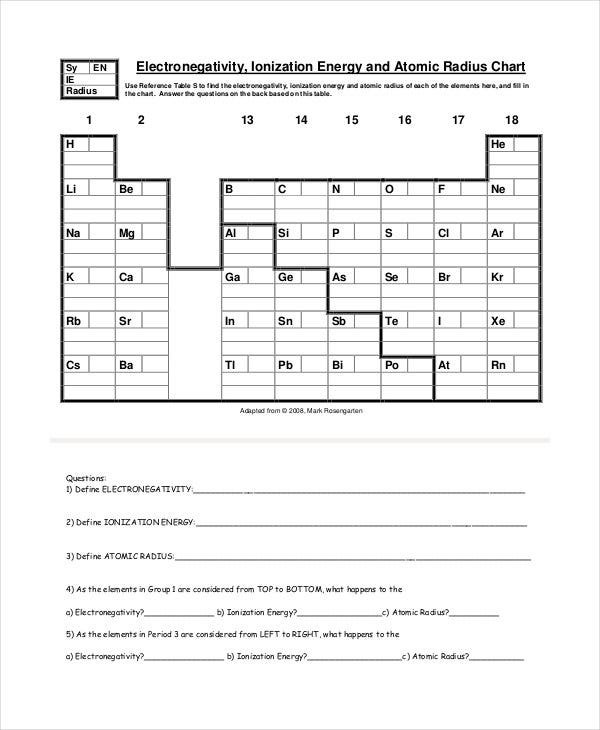 These Element Electronegativity Chart Templates are the based on the Linus Pauling Electronegativity Scale, Mulliken Scale, and Allred-Rochow scale. 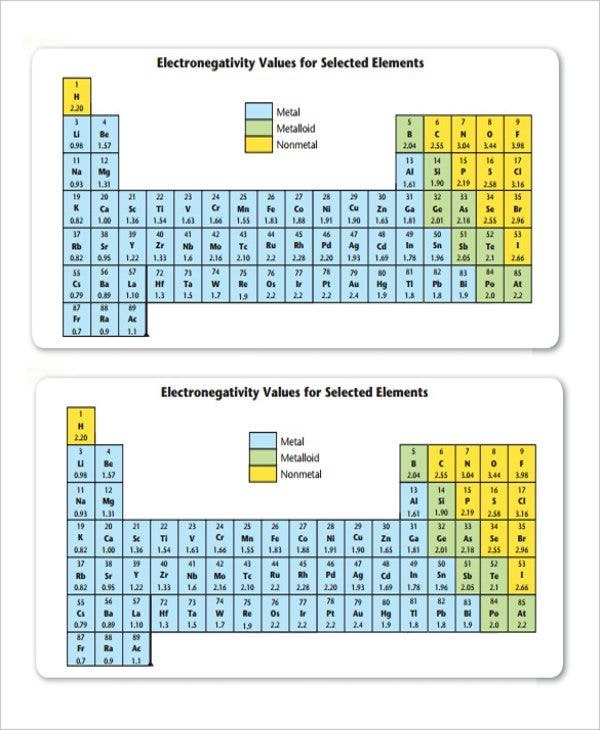 With these templates in hand, it’s very easy to calculate the difference between electronegativity values. Only the absolute difference is important. You may also see Run Chart Templates. 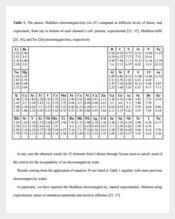 Pauling Electronegativity Chart Templates are the most sought after ones. 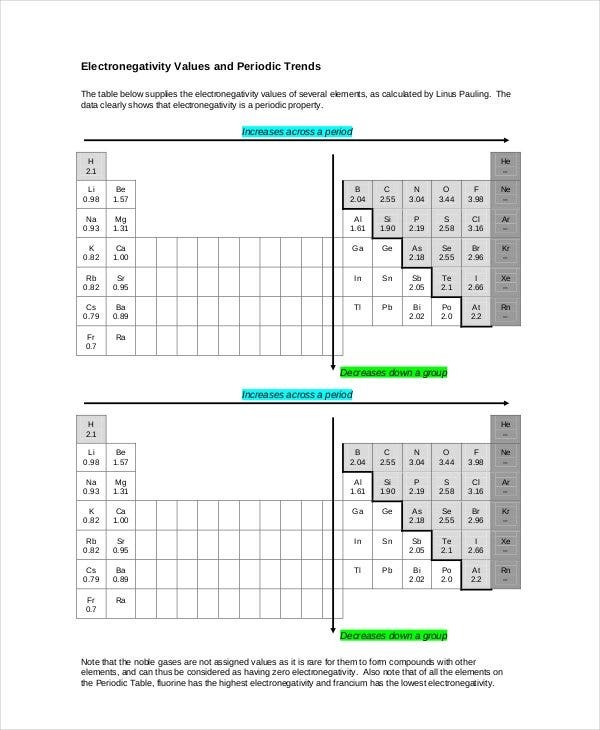 These Pauling Electronegativity Chart Templates consist of values intended for the elements in the standard and stable oxidation states. 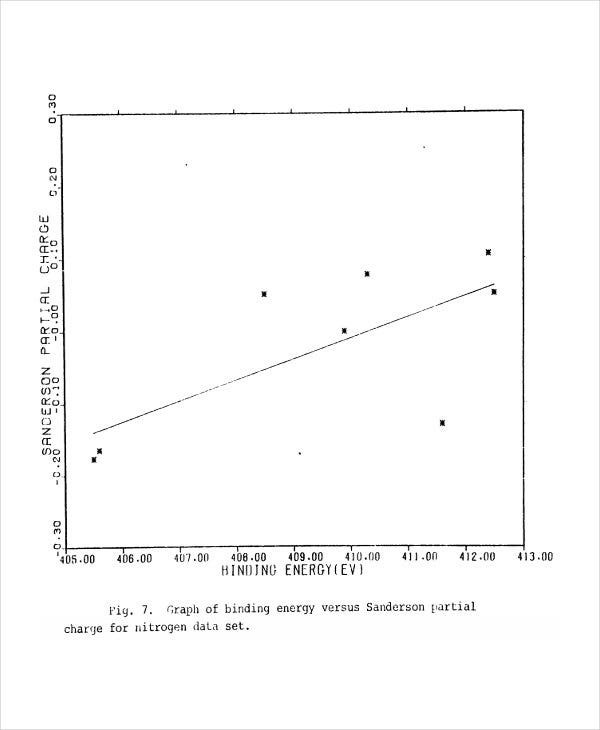 These were the charts chosen by Pauling as a 0.7, close to that of cesium. The unit used for the electronegativity is Pauling. 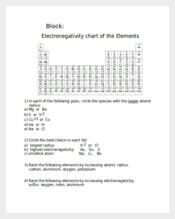 The Chemistry Electronegativity Chart Templates list out Chemical elements of the periodic table which are listed by electronegativity without any accidental mistakes. 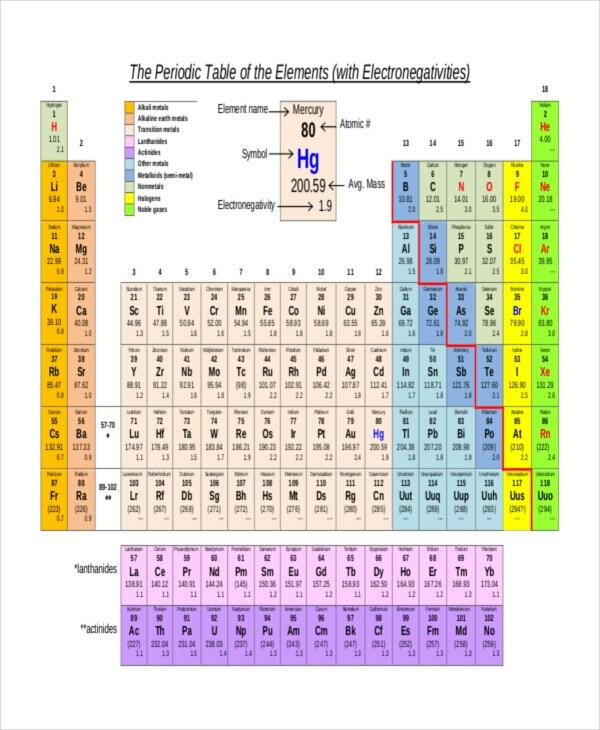 The chart consists of 118 elements of chemistry that starts with Actinium and ends with Fluorine. Furthermore, they even provide you health effects, environmental data, and chemical properties of each element. This electronegativity estimated chart developed by Robert Mulliken used the magnitude of the ionization energy and the electron affinity. 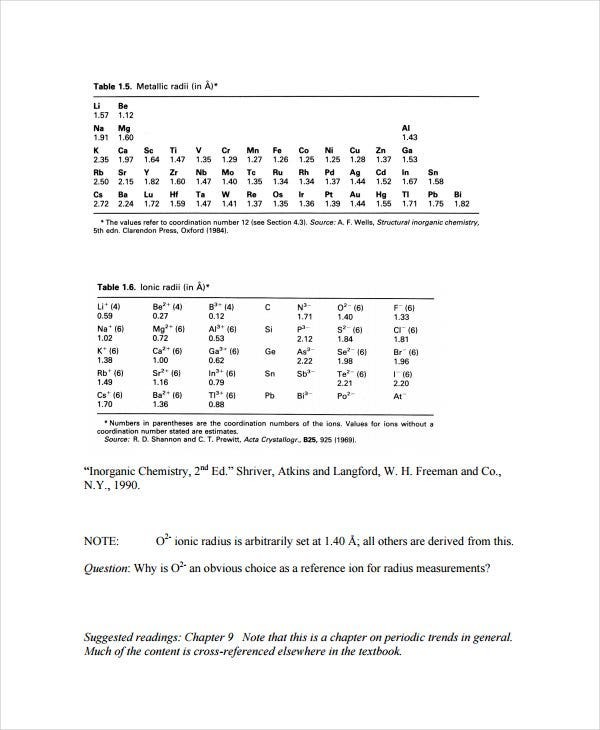 Our Mulliken Electronegativity Chart Templates help you highlight the relationship between electronegativity and the tendency of atoms to form positive or negative ions. 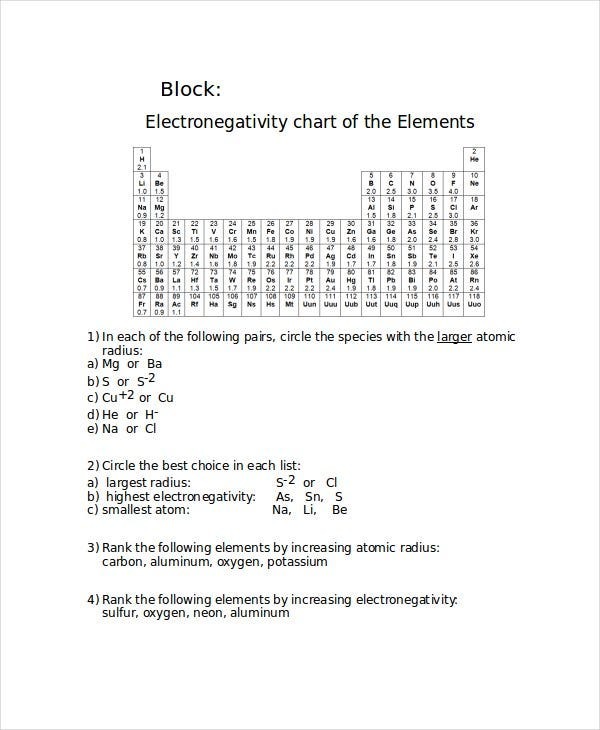 These Increasing Electronegativity Chart Templates have values for electronegativity which run from o to 4. Most of these graphics are in Adobe Illustrator, Fireworks, and Photoshop. You can also use this chart to predict whether the molecule is polar or nonpolar. These can plague your thought further on Electronegativity Charts. 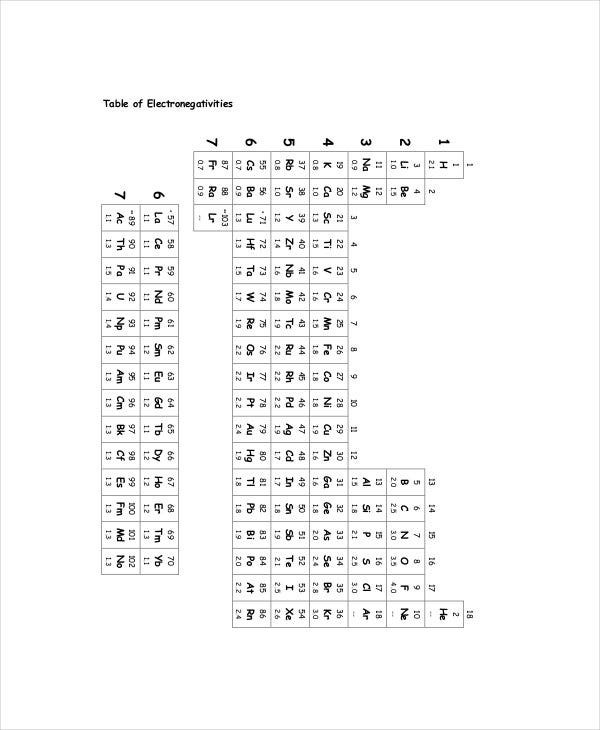 This Electronegativity Chart is designed and developed by A. Louis Allred and Eugene G. Rochow, where the electronegativity is calculated in an appropriate force unit. 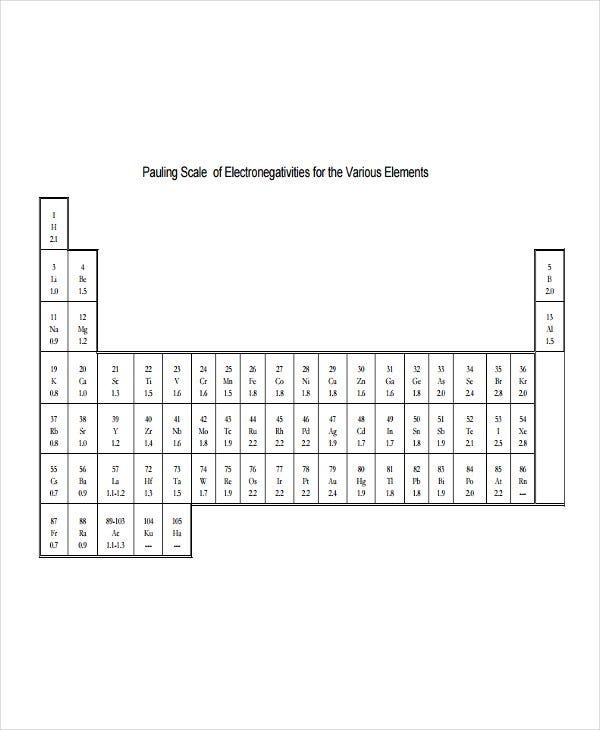 The electronegativity chart templates are accurate due to the involvement of shielding that prevents electrons from reaching their real nuclear charge. Since the electrons have the same negative charge, they will repel each other. 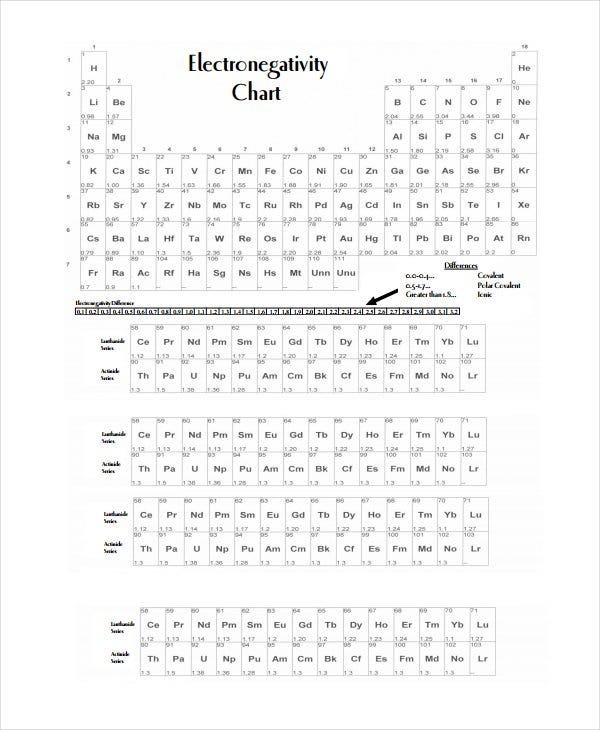 Allen Electronegativity Chart is perhaps the simplest electronegativity scale. 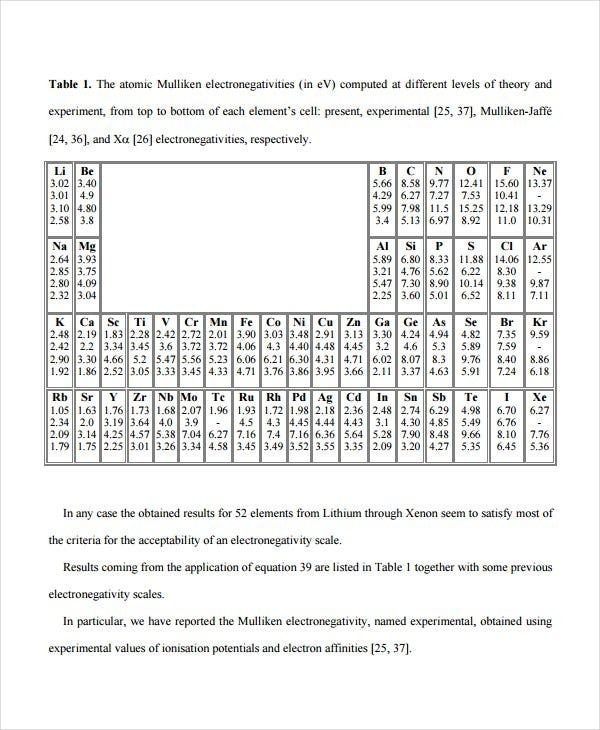 These Electronegativity Chart Templates significantly relate the average energy of the valence electrons in a free atom. Editors can download and experiment with this template. > What is a Polarity Covalent? Unlike the nonpolar covalent bonds, covalent bonds never share the same electronegativity Value 3D. In other words, bonds that are partly ionic are called covalent bonds. Polar covalent bonds are also called as molecular bonds. In Polar covalent bonding, electronegativities are not equal. That means they are not shared equally. And as a result, partial ionic charges develop. You may also see Excel Chart Templates. A chemical bond that forms between two ions with opposite charges is called an ionic bond. Ionic Bond is the process in which the atoms of electrons transfer entirely in the bond. Ionic bonds form when one atom gives up one or more electrons to another. Take the example of Sodium Chloride. > What Happens if Two Atoms of Equal Electronegativity Bond Together? If two atoms of electronegativity bond together, then the bonding will be found on average halfway between the two atoms. And this could be considered as a purely covalent bond. That means the electrons in the molecular orbital move around all the time with the orbital. For example TH2 or Cl2. You may also see Flow Chart Templates. > What is the Diagonal Relationship in a Periodic Table? 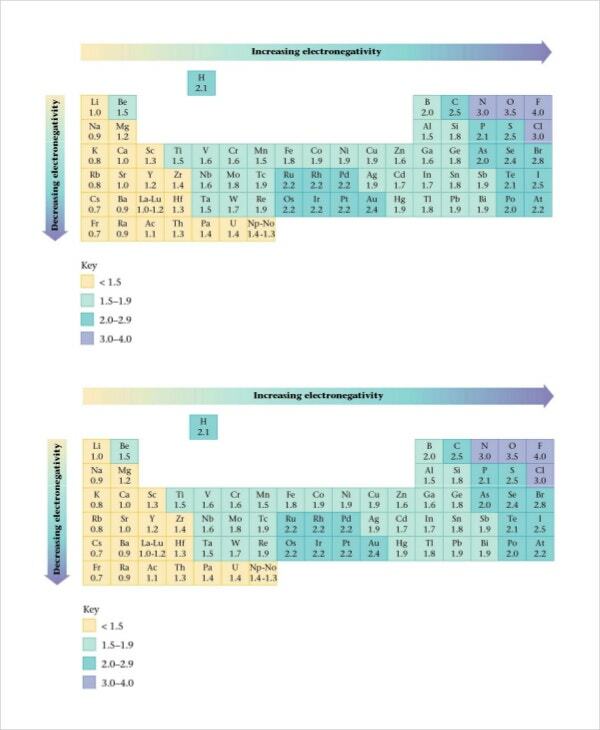 A diagonal relationship is a bonding within the periodic table by which individual elements in the second period have a close chemical similarity to the elements of the third period. A diagonal relationship is bonding between particular pairs of diagonally adjacent items in the second and third periods of the periodic table if we put it directly. As a result, the pairs of boron and silicon, beryllium and aluminum, and lithium and magnesium pose same properties. > What is the Easiest Way to Remember a Periodic Table? Fluorine is the most electronegative element in the periodic table. If you remember this fact, knowing the periodic table will be more comfortable than mugging up blindly. Because electronegativity of all the elements always increases towards fluorine in a periodic table. You may also see Gantt Chart Templates. > What is a Nonpolar Covalent? Electronegativity values help you determine whether a bond can be classified as nonpolar covalent, covalent, or ionic. In a nonpolar covalent bond, two atoms share a pair of electrons, one with the other. That means, in a nonpolar covalent bond, two nonmetal atoms share the same electronegativity. Methane is one best examples for Nonpolar Covalent Bonds. How do You Determine the Electro Negativity of an Atom? In Chemistry, the electro negativity of an atom is the difference between the highest atom and the lowest atom. The Sample Chart Templates results can help to determine whether a bond is a non-polar covalent or polar covalent. To start with, find the difference between the two atoms. Pick an atom with a higher value and then subtract that number from an atom with a lower value. The difference between the two is the covalent bond. Sure, the method is so simple, but that’s exactly how you would find the quality of the bond. Results below 0.5 indicate that the bond is non-polar covalent. Results between 0.5 and 1.6 indicate that the bond is a polar covalent. What makes an Oxygen Atom Electronegative? The first thing you need to understand is that the term electro negativity simply means the tendency to attract more electrons. Now, in answering the question above, we will assume a correlation between Hydrogen and Oxygen and use water as a preferable example since it has both oxygen and hydrogen. Remember, the electro negativity of an atom increases across the periodic table. This Chart Templates explains why oxygen is more electro negative as opposed to hydrogen. Hydrogen, too, is electronegative. Unlike oxygen, though, its electro negativity is rather lower. As such, it tends to donate an electron to oxygen. Which Element on the Periodic Table has the Highest Electro Negativity? Fluorine is known as the most electro negative element in the periodic table. Its chemical symbol is F and it has an Atomic number of 9. It is important to keep in mind that at room temperature, Fluorine is a pure gas of a diatomic molecule. Moreover, it is the lightest element in the halogen’s family. Its primary color is pale yellow, usually in colored gas. 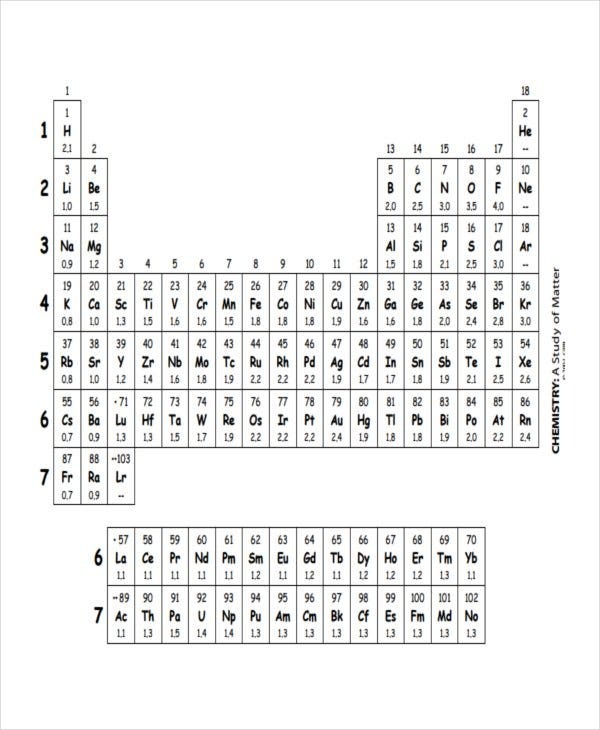 Electronegativity Chart Templates can be really helpful in measuring the tendency of an atom to attract the electrons. 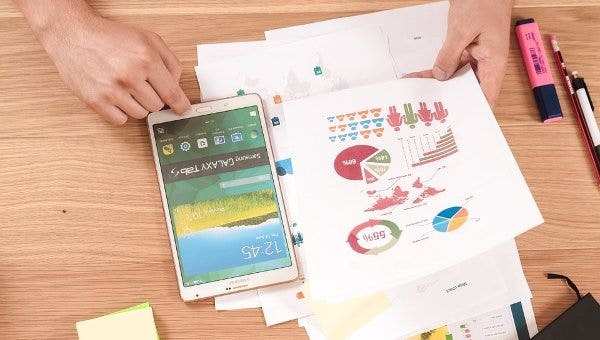 There is Best Tally Chart Templates available on the web easily and that has the information about all the elements present in the nature and they can be used for the many such purposes.